Black Friday Comics Sale! published on November 25, 2016 Read more posts by the author of Black Friday Comics Sale!, BugbyteNo Comments on Black Friday Comics Sale! Hey! Whether you’re in the US celebrating Thanksgiving, or anywhere else celebrating an ordinary Thursday, we wanted to say thanks to our readers with a Black Friday offer in our digital comics shop on gumroad. Enter the code leftovers at checkout for 15% off everything in the shop, valid through Sunday 11/27/16! We’ll also be offering a couple more coupon codes throughout the rest of this holiday season – sign up for our email newsletter to keep updated! EXTENDED! Lazy Weekend Sale in our digital shop! EXTENDED! Lazy Weekend Sale in our digital shop! published on November 24, 2015 Read more posts by the author of EXTENDED! 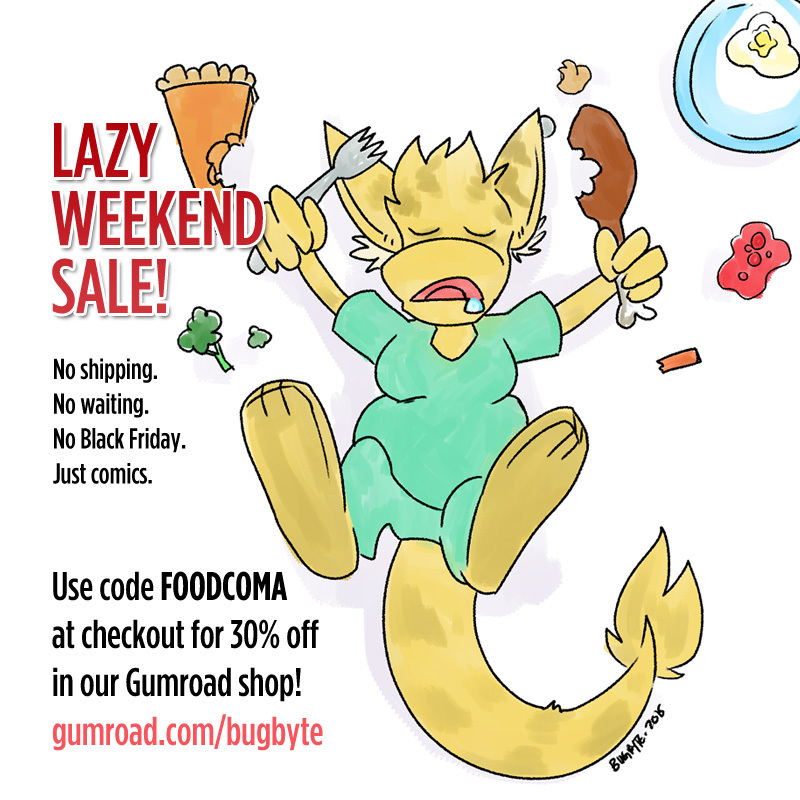 Lazy Weekend Sale in our digital shop!, BugbyteNo Comments on EXTENDED! Lazy Weekend Sale in our digital shop! We’re having a sale from today (11/25) through Sunday (11/29) Monday (11/30)! 30% off everything in our digital shop when you use the code “foodcoma” at checkout! Not a lot going on on this page, but no worries: there’s another update coming tomorrow! There’s a new vote incentive up this week, the second in a series of new coloring styles I’ve been trying out for work on Chapter Seven. I’m also willing to take ideas or requests for future vote incentive drawings, so if you have any characters or ideas in mind, leave a comment or post on the forum! After looking through the script I’ve got going, and some of the pages I’ve got together, it looks like I’m running short on materials for working on Chapter Seven – specifically, Chio-colored markers. I’ve been using the same set of markers for the past six years, and they’re finally burning out on me. I work as a freelance designer, and business has been slow this past month, plus I’m getting ready to move to a new house which has an assortment of related costs. To try and alleviate the cost of picking up the new colors I need, I’ve added a special donation wallpaper to the sidebar. If you donate any amount, you can download a copy in your choice of two large sizes. Picking up a copy of the book would also help out (there’s a coupon code once again this month, use GREATBOOK when checking out from lulu.com to get 10% off your order. I also have an extra copy on hand that I’m willing to let go for $12 + shipping which I’ll sign and draw in just for you!) and I’m also planning on putting some of my original drawings up for sale, since all they do is sit around and take up space in my drawer, anyway. I’ve been thinking about doing a little side story thing in addition to the regular comic, just for fun. I’ve drawn so far ahead that I literally feel like I have nothing to do other than a little write up for the new pages as they go up. Being prepared is almost boring! Vote if you get a chance!